Vehicle maintenance may be a labor of love, but your aching back and feet must be begging for a rest. Best Buy Auto Equipment supplies all the equipment that automotive professionals need to improve operational efficiency and profit potential. With a quality automotive lift in your garage or service bay, you can finally expand your service offering and attract new customers to your business. Our Auto Lift heavy-duty four-post lift selection provides the convenience of seamless operation and 12,000 to 14,000 pounds of lifting potential. Shop from our selection today to find the perfect solution for your business. While shopping, don’t forget to register your account and sign up for our newsletter! 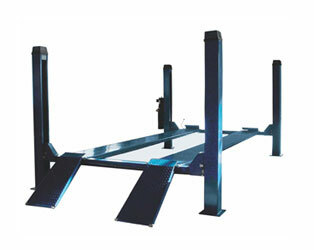 An Auto Lift four-post heavy-duty car lift may be the solution you need to service large cars, trucks, vans, and sport utility vehicles with ease. We offer several different designs to suit any preference or requirement. Our cable-driven car lift features a simple lever release system and redundant safety locks to keep mechanics and technicians safe while working in hazardous spaces or lifting heavy loads. The cylinder is stowed beneath a single-piece diamond plate track to save on valuable space. The safety latches maintain contact with the rack as the lift ascends and will drop into place as the lift rises. Safety latches engage in three-inch increments. We also offer a chain-driven Auto Lift four-post heavy-duty car lift. This unit comes with a single-point pneumatic safety release mechanism and diamond plate non-skid runways. These hydraulic lifts feature a heavy-gauge “C” channel construction. They also require minimal maintenance. Auto Lift recommends weekly lubrication, as well as monthly safety inspections. Chain-driven models provide 14,000 pounds of lifting potential, which will allow you to service a wide variety of vehicles. Heavy-duty lifts are ideal for dealerships, fleets, any automotive businesses. Maximize profit potential while servicing cars faster than ever before. Many of the Auto Lift heavy-duty four-post lift models we offer are also eligible for interest-free financing for up to six months. Submit your financing application today without any obligation to buy! If you have any questions about our selection or would like to learn more about shipping, please contact us today to speak with one of our experienced customer service representatives.